So what would she wear it with? "I think I would wear this with my high-waisted pegleg trousers, with an oversized white blouse tucked in, a leather belt, and either a slouchy cardigan or a blazer for some structured contrast." 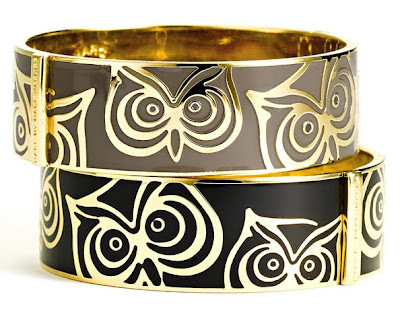 It sounds like a chic, simple, on-trend ensemble that lets the owl bangle shine as a statement piece. Nicely done. Maggie, please email me for details on how you can claim your prize. For the rest of my readers, just a reminder that the giveaway for tickets to the Crème de la Crème wedding showcase is still happening until October 29th. The latest buzz from the organizers is that they've added an Oscar de la Renta runway show to the agenda. If you're as big a fan of his classic elegant looks as I am, you won't want to miss this. i'm so jealous to the winner..
Love this bangle!! ;) Thanks so much for visiting Sunny's page! !